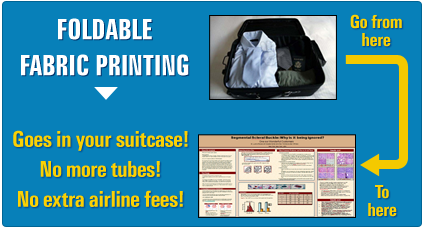 Foldable fabric posters go in your suitcase! No more Tubes! No more extra airline fees! "Just received the poster... FANTASTIC JOB! It looks amazing! 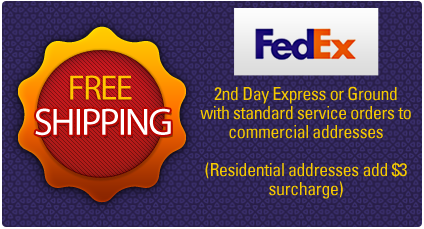 I'll be recommending your service to all of my colleagues from now on." "Thanks very much for your help; I look forward to using your company in the future and recommending it to my friends." "I just want to let you know that I received the poster and it is very impressive. Thank you for your quality and speed of service"
"I got the poster early this morning. Great job guys! It looks very nice! I'm very happy with your service and price. I'll be recommending and twitting you to everybody." "The posters arrived today and they look great. Thank you, again." "Perry Stein and David Starke at P&D Display Graphics; cheapest, quickest and most knowledgeable oversized poster board vendors I've ever dealt with." "Just wanted to say thank you for the great work on the poster. Beyond expectations in appearance and customer relations. You guys were awesome and I appreciate the help." "Thank you again for the fantastic and fast service!! I just received the poster, and it looks great! I look forward to working with you again in the future." "The poster you guys printed (and helped me format) for me (Predictors of Mentoring Benefits Among Pediatric Staff Nurse Prot�g�s) was great! I've been singing your praises and referring business ever since. 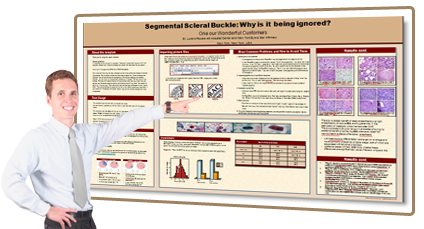 The poster won first place out of 50 research posters at a national conference in early April. I was psyched!" "Received my poster this am in CA and it looks fantastic. Thanks SO much. I live in Okinawa, Japan and I just couldn't find someone to print it properly ... found you on the Internet but worried about the end result ... turns out I didn't need to worry. Thanks!" "You recently printed a poster for me. It came out awesome and I won first prize in our university showcase with it!" "I cannot thank your company enough for the wonderful service you have provided. I have shared the poster and the printing service with many of my colleagues who are excited about the future opportunity to work with your company. I am sure you will be hearing from my friends soon! Again, a million thanks for a job well done and for service second to none!" "Thank you, you guys are great! We will for sure be contacting you again for future Conferences." "I received the poster. It looks beautiful. Thank you for the excellent service." "Thanks! - These look great. You could leave me in a room with a thousand computers for a thousand days and I couldn't come up with something like this ever." "I wanted to thank you again for your unwavering support and effort to deliver the Topamax project. What a beautiful quality job you did, we are eternally grateful"
"I just wanted to let you know that the poster looks absolutely wonderful. I recommended your services to attendees at the conference and I will definitely be encouraging others in my office to use your services as well!" "I think 37 minutes may be some kind of record. As ever, your customer service is top notch"
"The photos were excellent - beyond anything I thought I would receive"
"Y'all rock! I have a second one I need printed at the end of the week and I look forward to using your business again." "Received the poster today. It's great. Thanks for all you help." "I just opened my poster. It's beautiful! It not only looks good but I really like the quality of the paper. You delivered as promised and I am delighted!" "They did a really great job on my poster!" Copyright © P & D Display Graphics LLC. All rights reserved.